Most of us have to go to the “import” section of the bottle shop to get the more worldly beers, but instead, Evo Terra and Sheila Dee went to the beers. Of course I’m sure that’s not the only reason this couple traveled to Europe, and will be going to Asia and Australia. There are probably museums, and natural landmarks, and what not, but I choose to focus on priorities. Beer is one of the highest priorities a human can value. When I first emailed Evo in early February (when I was supposed to write this article), he wasn’t sure what to expect from Danish beers. He mentioned not being a fan of their well-known Carlsburg. However, my choice to be lazy strategically delay the publication of this post paid off. ShEvo found success in Copenhagen! 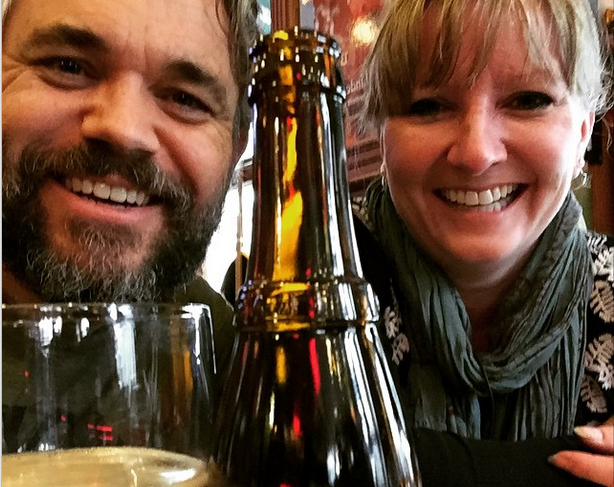 Per this February blog post, the duo “rounded out the list of ‘must drink at’ craft beer places” in the Danish capital. They went to Fermentoren and Lord Nelson, and in Evo’s estimation, they were both “quite excellent.” Evo gave a bonus point to Fermentoren for giving them a free bottle of beer—a Hip Hops Beats You – IPA from Ghost Brewing. Lord Nelson’s website describes itself as “a small bar located in the heart of Copenhagen [specializing] in draught Danish microbrewery beers and ciders.” Once 3D beer printing is perfected, I’ll be able to give you more than my impressions of the pictures. Currently all I can really say is that the cider farmhouse looks pretty, and that I don’t know what pork scratchings are. Sheila also had praise for the Danish’s beer making ability, saying they produced “a mighty fine beer.” Not Carlsburg, and more than just Mikkeller and To Øl. Specifically, she and Evo referred to Ølsnedkaren, where they were finally happy to pay 10 bucks for a beer. The website text is all in Danish, but the pictures show a nice place with people enjoying themselves. Of course, so do Bud commercials, so I guess we’ll have to take ShEvo’s word on it. Despite illness, Evo managed to drag himself out into the Belgian craft beer world and get himself a Trappist Westvleteren 1 (Brouwerij De Sint-Sixtusabdij van Westvleteren.) Maybe it was cold medicine, but his take on it is that it’s either the best beer in the world or the best Belgian beer. The next stop was England. They weren’t thrilled with the beer selection in general, but Sheila called the beer at Brew Dog “flavorful.” Evo was ecstatic to have hoppy beer again, as you can see from their video. I’d asked Evo (you know, back when I was supposed to have published this) if what they say about the English is true…that they drink their beer warm. Back then he’d said that no one drinks warm beer, unless it’s a “Hot Scotchy.” I don’t know what that is. I’m not worldly like that. Evo had said that pilsners and lagers were typically served cold, so maybe I won’t have to bring my own mini fridge if I ever go back. English pubbery definitely seemed like a mixed bag of goodness and alrightness. Sheila’s impression of the pub The Brewery Tap was “decent.” ShEvo had good things to say about The Bull’s Head in Mobberly, calling it a “lovely pub.” Sheila found an excellent beer selection at A Bar Called Pi (along with the pies, of course.) Generally, they noted that while they love “craft beer,” the “real ale” of England had yet to grab them. Watch them during an 11-hour drinking stint at a pub (The Builders Arms) that looks like it came straight out of one those British murder mysteries I like. I looked, but I didn’t see Inspectors Lewis, Morse, Barnaby or Foyle. All in all, since beginning their adventure, they’ve had 90 new beers. Notice in their latest podcast that Sheila didn’t say 90 good beers. Still, that’s a few notches on the ole’ Untappd belt! Support ShEvo (and get stuff).